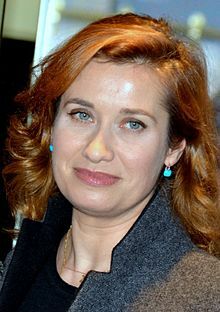 Emmanuelle Devos (born 10 May 1964) is a French actress. She is the daughter of actress Marie Henriau. She won the César Award for Best Actress in 2002 for her performance in Sur mes lèvres, directed by Jacques Audiard. She has also been nominated further three times for the award. She was a member of the Jury for the Main Competition section at the 2012 Cannes Film Festival. ^ a b "Emmanuelle Devos". AlloCiné. Retrieved 11 December 2010. ^ "The Jury of the 65th Festival de Cannes". festival-cannes.com. Cannes Film Festival. Archived from the original on 2012-05-24. Retrieved 2012-04-25. ^ "La vie des morts (original title)". Retrieved 2012-09-30. ^ "Oublie-moi (original title)". Retrieved 2012-09-30. ^ "Consentement mutuel". Retrieved 2012-09-30. ^ "Anna Oz". Retrieved 2012-09-30. ^ "Nearest To Heaven". Retrieved 2012-09-30. ^ "It's Easier for a Camel..." Retrieved 2012-09-30. ^ "Ceux qui restent". Retrieved 2012-09-30. ^ "Two Lives Plus One". Retrieved 2012-09-30. ^ "Plus tard". Retrieved 2012-09-30. ^ "La permission de minuit". Retrieved 2012-09-30. ^ "Le Fils de l'autre". Retrieved 2012-09-30. Wikimedia Commons has media related to Emmanuelle Devos. Unspoken is a 2008 Belgian drama film. It was written and directed by Fien Troch, produced by Antonino Lombardo, the film tells the story of Grace, who is still grappling with the disappearance of her daughter five years earlier, and her husband Lukas, who is trapped in his own helpless grief. He and Grace have long since stopped communicating, as Grace confronts a series of small absurdities in her apartment building, Lukas finds himself unable to complete even the simplest of daily tasks. When something truly heartbreaking happens in a family, the deepest response is often unspoken, Unspoken had its world premiere at the 2008 Toronto International Film Festival. It has received praise from film critics and won various awards from numerous film organizations. The film was named Best Film of 2009 by the Belgian Film Critics Association winning the André Cavens Award, Emmanuelle Devos received Best Female Performance at the 26th Torino Film Festival. The film was nominated for the Grand Prix at the Flanders International Film Festival Ghent. Read My Lips is a 2001 French film by Jacques Audiard, co-written with Tonino Benacquista. The film stars Vincent Cassel as Paul, an ex-con on parole, and Emmanuelle Devos as Carla, despite their different backgrounds and initial fear of each other, they end up intimately related and helping each other. The film is set partially in the offices and partially in the underworld of Paris. Carla, a lonely woman burdened by lack of respect from her co-workers and her friend, Annie. Carla is introduced immediately with a shot of her putting in her hearing aids, after she faints from exhaustion she accepts the bosss offer to hire an intern to lighten her load. The first applicant to be her assistant, Paul, is an ex-convict who is not technically qualified to be Carlas assistant, pauls affable nature and bad boy spirit relieve Carlas loneliness and open up new possibilities for her. She rebuffs his initial clumsy sexual advances, but gradually become a team, using creative. Paul convinces her to help him – by using her lip-reading skills – to rob Marchand, reluctant at first, Carla becomes more intrigued as problems arise. Puteaux is a commune in the western suburbs of Paris, France. It is located in the heart of the Hauts-de-Seine department 8.7 kilometres from the center of Paris, La Défense, Paris business district hosting the tallest buildings in the metropolitan area, spreads over the northern part of Puteaux and parts of the neighbouring communes Courbevoie and Nanterre. The inhabitants of Puteaux are called Putéoliens, the creation of the city dates from 1148, by Abbot Suger and gave him the name Putiauz. The foundation of Puteaux part of other towns in the region by Abbot Suger, as Carrières-sur-Seine, Vaucresson or Villeneuve-la-Garenne. This appeal was reinforced by certain privileges granted by the Abbot Suger, the name Putiauz comes from the old French Putel, which means a quagmire or swamp and was certainly making reference to the condition of the area before its reorganization. But another etymology exists, hence the name Puteaux would come from Latin puteoli, the name of Puteaux in turn appears to the sixteenth century or seventeenth century. Legend has it that Puteaux inspired the story of the gadfly from La Fontaine, located on the left bank of the river Seine, Puteaux borders Courbevoie to the north, Nanterre to the west and Suresnes to the south. In the east, Puteaux is connected to Paris by the bridge of Puteaux near Neuilly, the territory of the commune of Puteaux includes the largest part of the Île de Puteaux, on the Seine. Within Puteaux several districts can be distinguished, the district Bas de Puteaux, located between the railway line and the Seine, is the oldest urbanized district. Notable in particular are the old church, the Théâtre des Hauts-de-Seine, the town hall, the town hall was built in 1934 and is a typical example of the architecture of this time. The boulevard Richard Wallace is the Champs-Élysées of Puteaux, the district La Défense is located in the north, separated by the circular boulevard. The district, developed since the end of the 1950s, is one of the business districts in Europe. It mainly consists of buildings, but some notable dwellings can be found within the district as well. The 65th annual Cannes Film Festival was held from 16 to 27 May 2012. Italian film director Nanni Moretti was the President of the Jury for the main competition, french actress Bérénice Bejo hosted the opening and closing ceremonies. The festival opened with the US film Moonrise Kingdom, directed by Wes Anderson, the main announcement of the line-up took place on 19 April. The official poster of the festival features Marilyn Monroe, to mark the 50th anniversary of her death, the Palme dOr was awarded to Austrian director Michael Haneke for his film Amour. Haneke previously won the Palme dOr in 2009 for The White Ribbon, the jury gave the Grand Prize to Matteo Garrones Reality, while Ken Loachs The Angels Share was awarded the Jury Prize. The official selection was announced on 19 April at Grand Hôtel in Paris, the festivals artistic leader Thierry Frémaux responded that people should not focus only on the competition films, The selection is an ensemble, you have to consider the whole package. Amos Gitai and Henri Alekan, shooting Esther, 1986.